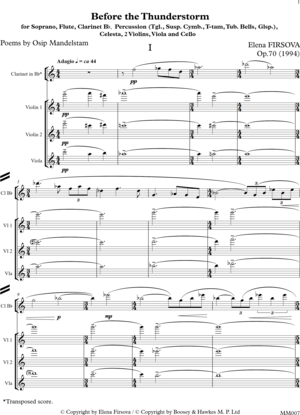 The chamber cantata Before the Thunderstorm to texts of Osip Mandelstam (1891-1938) for solo soprano and ensemble of nine performers was completed in March of 1994 at Keele, Staffordshire, UK. The genre of solo cantata is probably the most important for me. 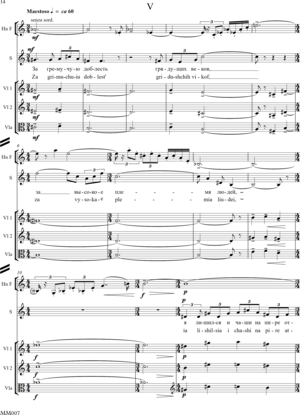 I have written quite a few cantatas for solo voice and different combinations of instruments almost at the regular intervals of time and every time this gave me very strong creative impulses, which act even upon the next few compositions. 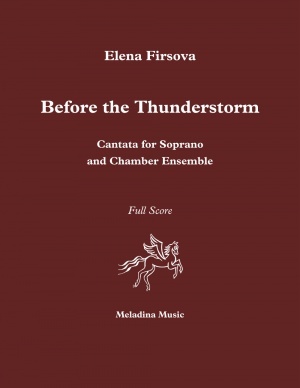 Before the Thunderstorm is already my sixth cantata. 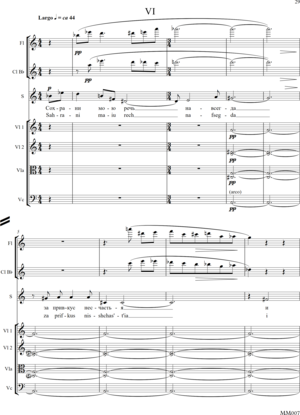 Like the two previous cantatas Earthly Life (1984) and Forest Walks (1987) it was commissioned by The Nash Ensemble. The work consists of the six move- ments, where the first is an instrumental introduction. I’ve chosen the texts from so called Moscow Notebooks (1930-1934) by Mandelstam, written a short time before his first arrest. The poems are full of presentiments of his impending cata- strophe. The title comes from the second line of the third poem: “...I feel with no fear that thunderstorm is coming…” The “thunderstorm” can mean many different things. For Mandelstam it meant his future imprisonment, exile and death in the concentration camp of GULAG. The first performance of the cantata took place on 7th of March 1995, at the Purcell Room, London with Patricia Rozario, sopr. and The Nash Ensemble conducted by Lionel Friend. My friend with the big beak! O, Nutcracker, my dear, little fool. But we can’t do it — no way!.. Help me, The Lord, to live through the night. Living in Saint Petersburg is like sleeping in a coffin. Eyelashes are stinging. Tear took a fancy to the chest. I feel with no fear that thunderstorm is coming. Somebody strange hurries me to forget something. It is stuffy, but nevertheless I deadly want to live. In the time, when the strip of dawn rises over the jail. In primeval beauty shine towards me. And it is only my equal who will kill me. For the resin of their circular patience, for the conscientious labour of their tar. So that by Christmas there will be reflected within it a seven-finned star. So that Tartars could lower princes in it into the sea. And for my Petrine execution, in the wood I’ll find an axe. Камерная кантата «Перед грозой» на стихи Осипа Мандельштама (1891—1938) для сольного сопрано и ансамбля из девяти исполнителей была завершена в марте 1994 года в Киле, Стаффордшир, Великобритания. Жанр сольной кантаты, наверное, самый важный для меня. Я сочинила довольно много кантат для сольного голоса и различных комбинаций инструментов, делая это почти через равные промежутки времени, и каждый раз это давало мне очень сильный творческий испульс, действовавший даже во время работы над следующими композициями. «Перед грозой» уже моя шестая кантата. Как и две предыдущие кантаты «Земная жизнь» (1984) и «Лесные прогулки» (1987), она была заказана «Нэш-ансамблем». Сочинение состоит из шести частей, где первая — инструментальное вступление. Я выбрала тексты из так называемых «Московских тетрадей» (1930—1934 гг.) Мандельштама, написанные незадолго до его первого ареста. Стихи полны предчувствий надвигающейся катастрофы. Название заимствовано из второй строки третьего стихотворения: «…Чую без страху, что будет и будет гроза…» «Гроза» может означать много разных вещей. Для Мандельштама это означало его будущий арест, изгнание и смерть в концентрационном лагере ГУЛАГа. Первое исполнение кантаты состоялось 7 марта 1995 года в «Перселл-Рум» в Лондоне. Исполнители; Патрицией Розарио, сопрано, и «Нэш-ансамбль» под управление Лайонела Френда. В час, как полоской заря над острогом встаёт. Последнее изменение этой страницы: 20:37, 23 марта 2019.